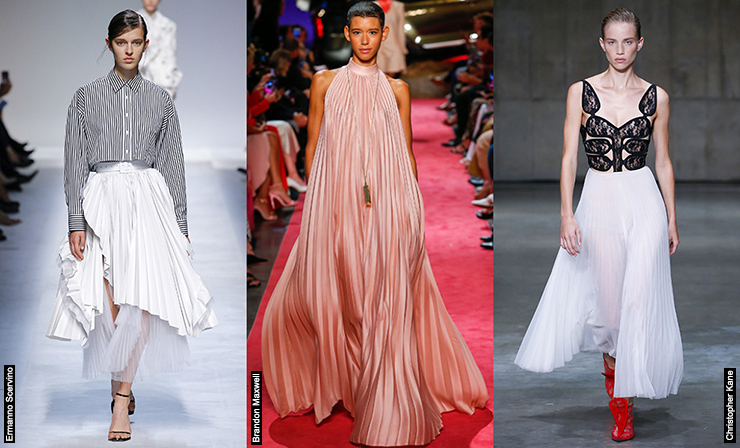 One of the most feminine trends comes back this season at the suggestion of well-known designers who seem as if they simultaneously agreed to confess their love for pleating during the fashion week season. The catwalks of New York, London, Milan and Paris were filled with a variety of embodiments of pleating, so The Fashiongton Post advises you to have a look at them now and find something suitable exactly to you. Today are known various methods of fabrics’ processing to achieve such elastic, shape-holding folds, but still the methods of dry heat treatment and using steam – when the fabric is coiled in a roll on a perforated tube -are considered to be classical. Yet from the second half of the last century, Japanese designer Issey Miyake, who invented his own way of processing fabric, can be considered the real king of pleating : in the late 1980s Miyake placed ready-made pieces between two thin sheets of paper, and then compressed it by the press under the steam pressure, while retaining the original shape. As a result, this technique has become the hallmark of Issey Miyake brand. During the spring-summer shows, most often we saw pleated-to-the-floor skirts and romantic monochrome pleats on the catwalks. But not only. Givenchy presented its blue dress decorated with a pleated “wing” sticking to the left, and its sleeves were also with folds. 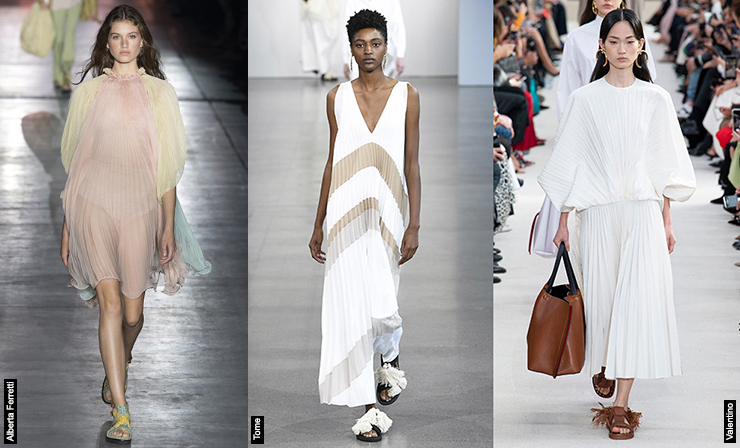 Another clearly distinguished trend from spring/summer runway shows to be admired by the 80s’ fans would be the sloping shoulder-shells, as in the collection of Pierpaolo Piccioli., as well as short flying skirts, as seen on the catwalk in the collections of Jil Sander and Acne Studios. The Fashiongton Post advises to forget about all taboos for the next spring-summer season, as today’s collections clearly prove that the restrictions – when combining the incompatible – will be completely eliminated, regardless of whether you want to wear a pleated dress with high boots or elegant shoes. Experiment!